We have lived in our rented house for more than 6 years and from the beginning I never liked the ugly water tank in my son’s bathroom. Luckily, my son was still quite young when we moved in and he was just thrilled to have his own bathroom! 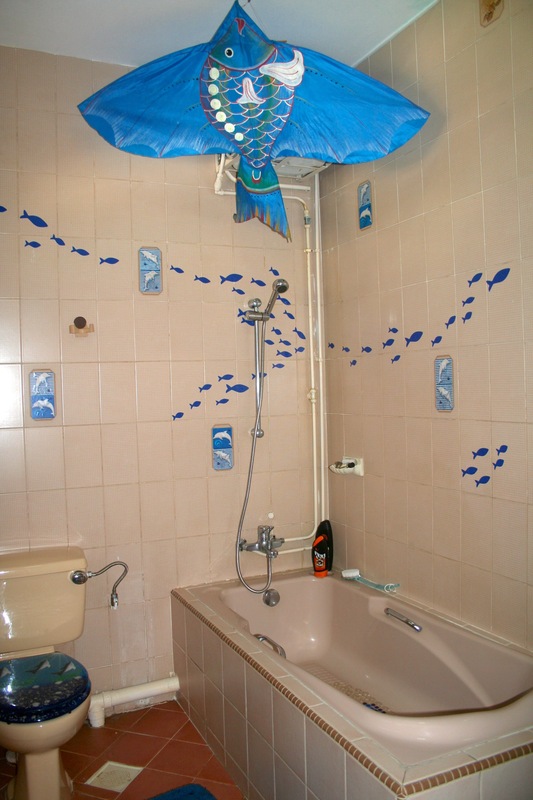 I tried to cover up the water tank as much as possible with a blue fish kite I had bought in Bali, and applied some bright blue fish stickers to the tiles to liven up the bathroom. A blue bathmat, toilet seat and hand towel completed the child-friendly look. Are bathrooms bad Feng Shui? 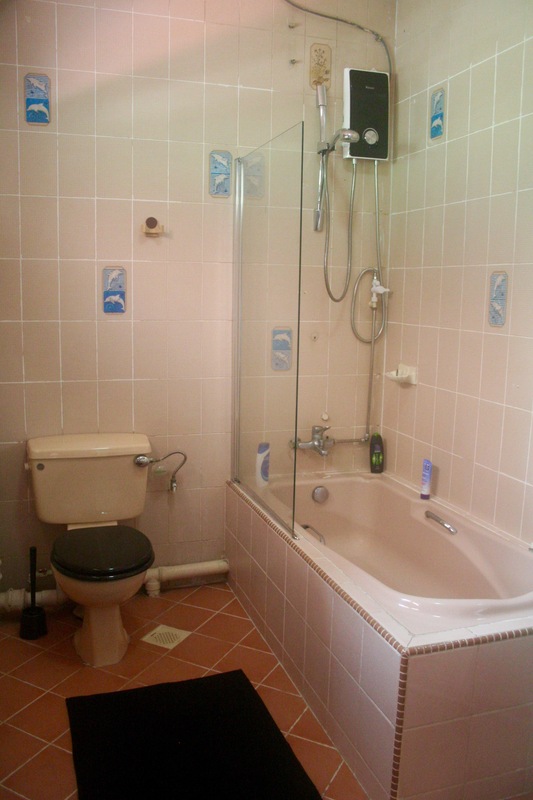 The blue accessories also served as Feng Shui measures to subdue the negative effect of the bathroom. 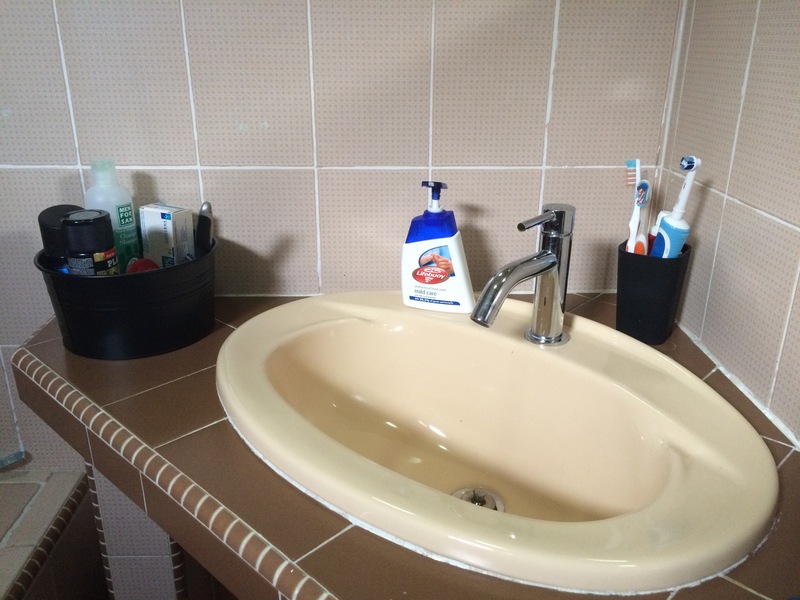 Bathrooms are a bit of a sticky point in Feng Shui because of the many drains that are feared to flush away the luck of the sector in which the bathroom is located. This particular bathroom is located in the West of the house which relates to “Creativity” luck and belongs to the metal element. In old bathrooms like this one, the best way of subduing its negative energy is to apply either the exhaustive element – in this case water – or the destructive element, which is fire. Hence my choice of blue accessories, but red would also be an option. We are generally very happy in this house and every now and then I change bits and pieces or move some of the furniture around. So after a couple of years I had a glass shower screen installed which gave the bathroom a slightly updated look. This year, finally, our landlady agreed to remove the water tank! It had gotten rusty inside and we agreed to replace it with an instant hot water heater. Together we went shopping for the new water heater and she chose a rather sleek-looking black model. The next day I bought black towels and a black bath mat and sourced a black toilet seat on-line. I also removed the fish stickers. What a difference this makes! I almost got carried away and started thinking about changing the handwash basin to a modern black one. But then I remembered how my landlady treasures everything about her house and I dropped the idea. After all, the old tiles are kind of nostalgic and I would not have wanted them to be damaged. Instead, I bought a couple of black accessories to complete the makeover. Black is also a colour representing the water element so it is another good choice for this bathroom. I am really pleased with the new look and my son is happy too. Sometimes you don’t need to spend a lot of money to make a room feel like new.